Estimate how long it will take to mow a lawn given a mower size, speed, and lawn size. Find how many acres per hour you can mow. The time it takes to mow a lawn is determined by several factors including the size of the lawn, size of the mower, speed the mower is moving, and lawn conditions such as hills or obstacles. The property size greatly impacts how long it takes to mow. Larger lawns require more mowing time for obvious reasons. Find how large your lawn is in acres to help find how long it will take to cut. The size of the mower deck impacts how long it will take to mow a lawn. A larger deck will allow the mower to cut a larger swath of grass in a single pass, allowing it to complete a lawn in a less time. 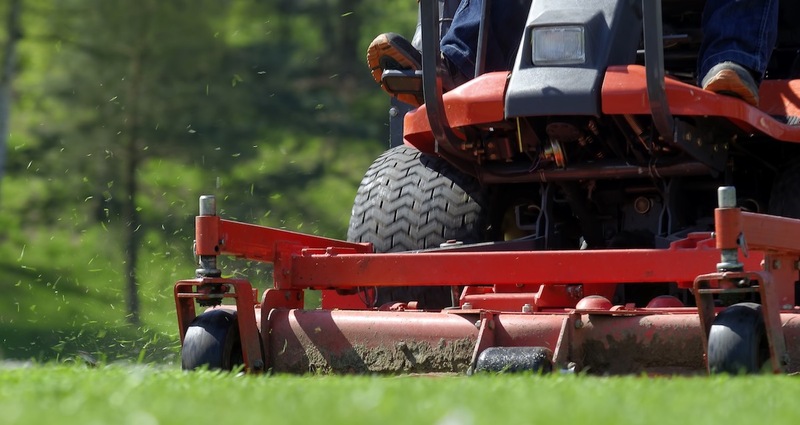 Larger mowers have longer blades which require a larger engine and are typically more expensive. Some lawn mowers are designed to cut at a faster pace than others. The size of the engine greatly influences how fast it can move and how fast the blades can spin. It is important to have sharp blades and not push your mower by going too fast to get an even cut and avoid damage to the lawn. The conditions of the lawn greatly impact how long it takes to mow. A yard with many curves, trees, hills, walls, and other obstacles will take much longer to mow than a square yard with no obstacles. It will be difficult to predict exactly how long these obstacles will slow mowing time, but keep in mind that the more there are the longer it will take. Muddy or overgrown patches of lawn can also take longer to mow or work around. Use our grass seed calculator to estimate how much seed is required to fill in these areas with grass or our sod calculator to estimate sod needed.